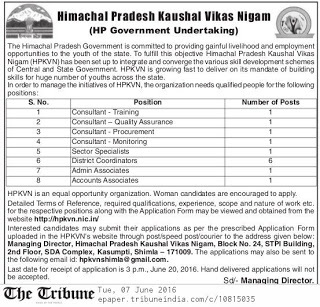 How to Apply: Application should be submitted through post / speed post / courier as per the prescribed Application Form to: The Managing Director, Himachal Pradesh Kaushal Vikas Nigam, Block No. 24, 5 STPI Building, 2nd Floor, SDA Complex, Kasumpti, Shimla-171009. Application may also be submitted through email to: hpkvnshimla@gmail.com Las date for receipt of application is 3 PM, June 20, 2016. Hand delivered applications will not be accepted.